Dr. Karen is passionate about helping people to help themselves get to a better place. 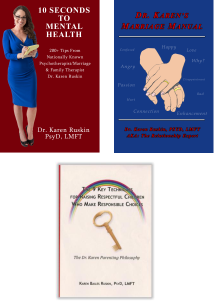 Dr. Karen has helped thousands of couples enhance their marriages, families resolve their conflicts, and individuals make significant long term life shifts since 1993, and continues to do so in her private counseling practice. Dr. Karen’s approach is direct, she tells-it-like-it-is (way before this became a common phrase) with compassion, passion, and professionalism. With her solution focused philosophy and practical do-able tips, she believes change need not take years.